Private, 12th (Service) Battalion (2nd South Down), The Royal Sussex Regiment. Brigade 39th Division. Army no. SD/2292. He was killed in action on 30 June 1916. There was no particular battle at this time so he probably died as a result of trench warfare. Private, 1st Battalion, The Royal Sussex Regiment. Army no. GS/2751. He was killed in action on 15 September 1916 in the Battle of the Somme. He was 21. He was the son of Maurice and Emily Botting of Hillside, Loxwood. Private 10th (Reserve) Battalion, The Queen’s Own (Royal West Kent Regiment), 123 Brigade, 4th Division. Army no. G/20708. He was formerly with The East Surrey Regiment. He was killed in action on 25 October 1918 in the Battle of the Selle. He was 20. He was the son of William and Kate Boxall, The Hollies, Loxwood. He is buried close to the east end of the Church, Outrijve Churchyard, Belgium. Regiment). Army no. TF/228577 attached to 12th Battalion, 17 Brigade, 24th Division. He was formerly with the East Surrey Regiment. He was killed in action on 29 October 1917. Captain, 1/4th Battalion, The Royal Sussex Regiment. 160 Brigade, 53rd Division. He was killed in action on 9 August 1915 during the Suvla Bay Landings. He was 30. He was the son of Lionel and Emily Constable of Coates House, Fittleworth. He is buried in grave II A 1 in Green Hill Cemetery, Turkey. He was educated at Radley College and his name also appears on the War Memorials in Littlehampton and at Radley College. Private, 12th (Service) Battalion (2nd South Down), The Royal Sussex Regiment, 116 Brigade 39th Division. Army no. G/16301. He was killed in action on 21 October 1916 on the Somme. He was 21. He is buried in grave XII B 8, Serre Road Cemetery No.2. Corporal, 7th Battalion, The Royal Sussex Regiment. 36 Brigade, 12th Division. Army no. G/15808. He was killed in action on 2 September 1918. He was 29. He was the son of George and Margaret M Day and born in Ifold. Private, C Company, 1st Battalion, The Queen's (Royal West Surrey Regiment), 3rd Brigade, 1st Division. Army no. L/6988. He was killed in action on 26 September 1914 on the Aisne. He was 30. He was the son of George and Phoebes Ede, Chapel Cottage, Alfold. He is buried in Troyon Chyd. Mem. 21 in Vendresse British Cemetery. Brigade, 12th Division. Army no. SD/1928. He was formerly with the 12th Battalion. He was the son of William and Ruth Foster of Hillside, Alfold. He is buried in grave V A 8, Epehy Wood Farm Cemetery. He was killed in action on 20 October 1914 in Flanders. He was 37 He was the son of George R and Emily F Gregory of Leytonstone. He died from his wounds on 19 September 1916. He was 24. He was the son of William and Sarah Anne Ketcher of Loxwood. Puchevillers is 19 kilometres north-east of Amiens. In June 1916, just before the opening of the Battles of the Somme, the 3rd and 44th Casualty Clearing Stations were set up in Puchevillers. He died of his wounds on 20 August 1918. He was 19. He was the son of Raymond and Mary J Packham of Blackbridge Lane. He was lost with the Battle cruiser at the Battle of Jutland 31 May 1916. He is remembered on 13, The Portsmouth Naval Memorial, Southsea. He was killed in action on 31 July 1917 at the Third Battle of Ypres. He was 22. He was the son of Richard and Anne E Powell of 10 Star Cottages, Chipstead. Private, 9th (Service) Battalion, The Royal Sussex Regiment. 73 Brigade, 24th Division. Army no. G/6658. He died of his wounds on 28 June 1917. 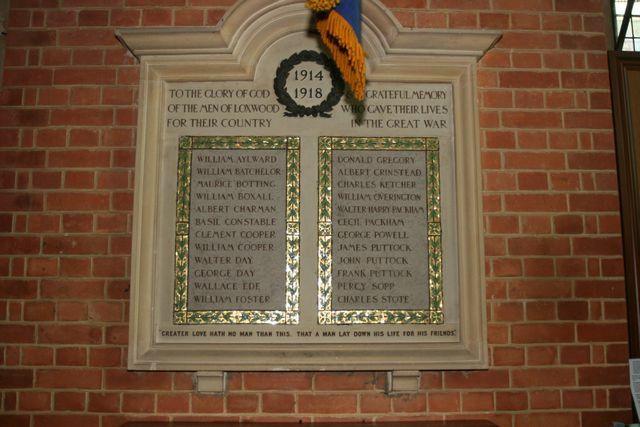 He is alos included on Billingshurst War Memorial. 1st Division. Army no. 4656. 73 Division, 24th Division. Army no. G/6225. He was the son of Mr J Puttock, Gunshot Common, Wisborough Green. Boy 1st Class, HMS Bulwark, Royal Navy J/25189/PO. He died when the Battleship blew up off Sheerness on 26 November 1914. He was 17. He was the son of James and Constance Sopp, Round Street, Horsham and formerly of Loxwood. He is remembered on The Portsmouth Naval Memorial, Southsea. reported their conviction that it was an internal magazine explosion which rent the ship asunder. There was apparently no upheaval in the water, and the ship had entirely disappeared when the smoke had cleared away. An inquiry will be held tomorrow which may possibly throw more light on the occurrence. The loss of the ship does not sensibly affect the military position, but I regret to say the loss of life is very severe. have lost their relatives and friends." HMS Bulwark, a 15,000 ton battleship was moored in Kethole Reach on the River Medway, opposite the town of Sheerness, Isle of Sheppey. It was part of the 5th Battle Squadron. She had been moored for some days and many of her crew had been given leave the previous day. They had returned at 07.00 hours that morning and the full complement was on board. The usual ship's routine was taking place when the disaster struck. A roaring and rumbling sound was heard and a huge sheet of flame and debris shot upwards. The ship lifted out of the water and fell back. There was a thick cloud of grey smoke and further explosions. When the smoke cleared, the Bulwark had sunk without trace. Not one of the Bulwark's officers survived. Saturday 28 November, an inquest was opened. On Monday, 30 November, the funerals of 21 of the victims took place in the Naval Burial Ground at Woodlands Cemetery, Gillingham. He died of his wounds on 27 May 1918. He was 21. He was the son of Charles and Laura Stote, Laker's Lodge Cottages, Loxwood. He was the son of Henry W and Elizabeth A Cole and the husband of Olive Cole of Loxwood. He was the husband of Violet M Howick of Loxwood.